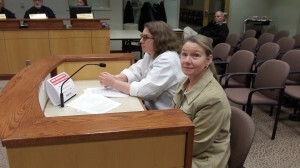 Kaymarie and Karen Novak (foreground) appeared before the CARA board Wednesday. Rarely has a financing request received as enthusiastic a reception from the Central Albany Revitalization Area advisory board as that of Novak’s Hungarian Restaurant. On Wednesday night the CARA panel unanimously recommended approval of a $126,000 loan to help the business restore the historic storefront at 208 Second Ave. S.W. and move there by next June from the Heritage Plaza shopping center. CARA has supported several projects on First Avenue. Noting that this one is on Second, CARA board chairman Rich Catlin hoped it would bring people to that block. “This is exactly what we need downtown,” Councilman Rich Kellum said. Mark Spence, another CARA board member, praised not only the project but the completeness and quality of the application. The loan has yet to be formalized by ARA, the Albany Revitalization Agency, comprised of the city council. Terms are eight years at one-and-a-quarter points above the interest rate on 10-year Treasury notes, estimated to total about four-and-a-half percent, to be repaid over eight years, with interest only due the first two years.